Partial screen shot taken on July 10, 2017. The Catholic University of Detroit Mercy in Michigan is currently listing the mega abortion provider -- Planned Parenthood -- as a "resource" for students. The online entry is raising concern among young Catholics who believe in the God-given, inalienable right to life, which naturally extends to the unborn. TFP Student Action has launched a petition calling for the removal of Planned Parenthood and other pro-abortion and pro-transgender advocacy groups listed by the university's Women's and Gender Studies department under "Online WGS Resources." "How can a Catholic university favor Planned Parenthood?" said TFP Student Action director, John Ritchie. "In good conscience, we can't stay silent and allow the Culture of Death to poison more young minds. No way. Not on a Catholic campus." 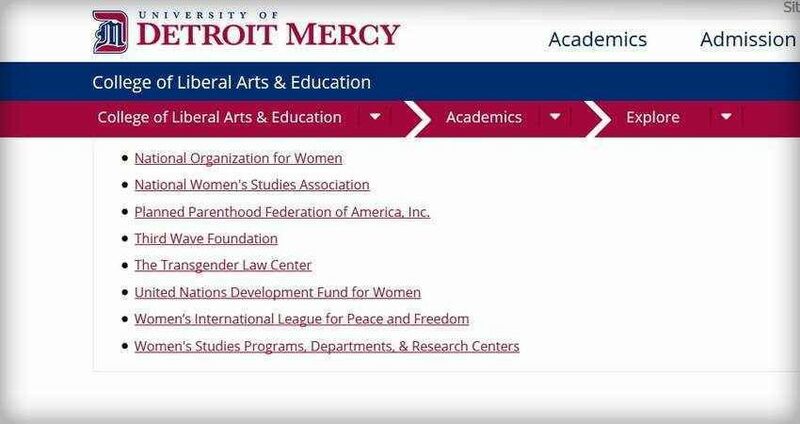 Planned Parenthood is not the only pro-abortion group listed by the University of Detroit Mercy. Others include the National Organization for Women (NOW), Amnesty International-USA, Feminist.com, Institute for Women's Policy Research, and Transgender Law Center. "Take note," said Ritchie, "the pro-transgender and pro-abortion advocates are on the same ungodly team -- working overtime to dismantle the family and deny the right to life." TFP Student Action invites pro-lifers to join its peaceful protest and call for the removal of all pro-abortion and pro-transgender groups currently listed online by the University of Detroit Mercy.